If you are a family with significant resources, you probably work with experts in many fields who assist in growing, retaining, and managing your resources. Without coordination, however, you may easily receive contradictory or inconsistent information. A lack of communication between various professionals can often result in discordant plans, negatively effecting your relationships, the preservation of wealth, and inter-generational success. These challenges are highlighted by studies that continue to show the vast majority of wealth is depleted by the second to third generation. While there are likely a multitude of reasons for this, one thing is clear: wealthy families benefit from coordinated and coherent advice from their respective professionals. The best way to accomplish this is through a Family office structure. The family office concept has its historical roots dating back to the 6th century. During that time, a “majordomo” would take charge of the affairs of a royal family. At the advent of the industrial revolution, the concept gained traction outside of royalty and the family of J.P. Morgan founded the House of Morgan in 1838 to manage the families’ legal and financial affairs. More recently, the concept of the Family Office became increasingly commonplace as western society grew wealthier, and the number of wealthy families increased. At the same time, rapid developments in technology, law, and financial markets required greater levels of sophistication and skill from financial professionals, leading to greater demand for their specialized services by the wealthy. These changes significantly diminished the role of the bank trust departments that traditionally served wealthy families. Still, for most Family Offices the minimum asset requirement remains in the $50-100 million range. 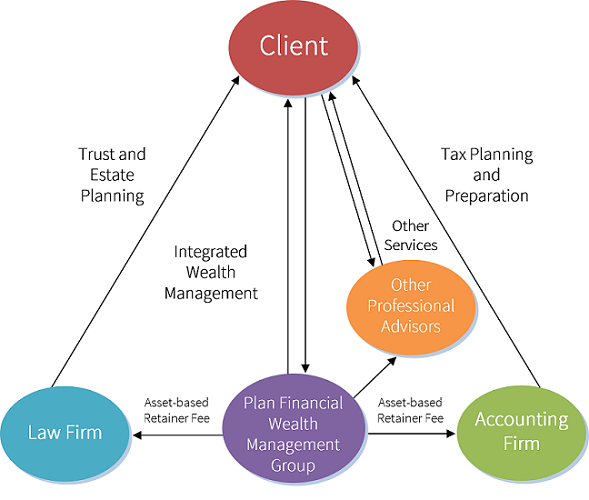 This is why Plan Financial’s Wealth Management Group developed the Family Office solution for middle to upper-middle class families, where the asset requirement may be as little as $1-2 million. We understand that your financial needs change throughout your lifetime. That’s why we work with you to develop wealth management solutions that fit your family’s life today and continue to grow and change as you do. If that makes sense to you, and you would like to learn more, we invite you to discover the Plan Financial difference.